Another number you could add to the list is 35 percent: the amount of funding the United Nations Humanitarian response plan has received so far of the US$316 million it needs. Caritas mobile teams have been helping conflict victims since the beginning of the crisis. Not just food and water but also medicines for chronic diseases and counselling to help people overcome the trauma of war. Where necessary, it has given cash grants. 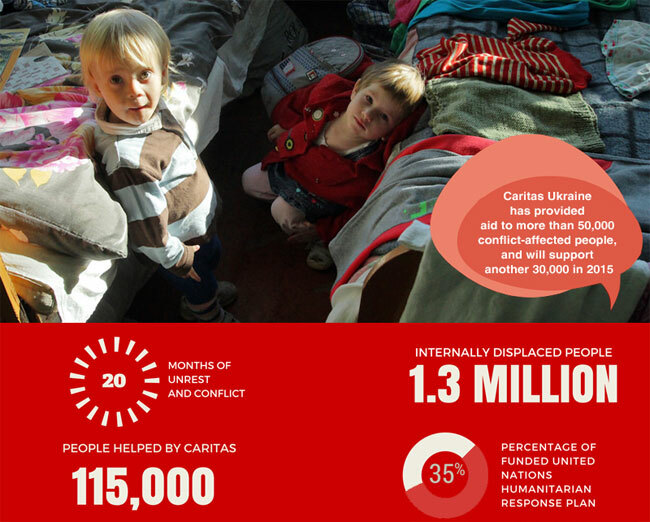 Caritas Ukraine has provided humanitarian assistance to more than 50,000 conflict-affected people, and will support another 30,000 during the remainder of 2015. In the past month, Catholic Relief Services and Caritas Ukraine have opened six child-friendly spaces to support trauma counselling for up to 500 children. The lack of financing for projects in Ukraine one of the main obstacles to Caritas member organisations helping the people. One of the reasons is that the crisis is often depicted as a political crisis in the media instead of a humanitarian crisis in which millions of people are suffering. Caritas will continue to provide help to those most in difficulty in the war-torn east of Ukraine such as emergency food, water, living and shelter supplies to families – and help them get back to work so they can support their families. “We’re hearing the things we’re hoping to hear,” Heinonen says. “Children are happy, and parents have a little bit of space and flexibility in their lives.” Space and flexibility that will help them rebuild their families’ livelihoods—and lives. “Children are happy” – three words that say so much more than the numbers of the Ukraine crisis.